What types of products does the California Lemon Law apply to? The Lemon Law applies to warranted new and used vehicles and consumer goods that are purchased at retail in the State of California and used primarily for personal, family or household purposes. The law applies to cars, trucks, motorhomes, motorcycles, appliances, etc. Does the Lemon Law apply to all vehicles? The Lemon Law applies to all warranted new and used vehicles that are purchased/leased primarily for personal, family or household use. The law also covers certain vehicles that are primarily used for business purposes. What type of business vehicles are covered by the CA Lemon Law? A business vehicle is covered by the CA Lemon Law as long as the business has no more than 5 vehicles registered in the State of California and the vehicle weighs less than 10,000 pounds. 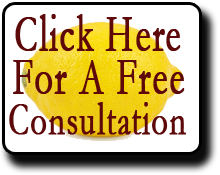 What are the limitations for CA Lemon Law claims? The CA Lemon Law will apply to any product or vehicle as long as the warranty is in effect. The Lemon Law may also apply after the consumer good’s or vehicle’s warranty has expired as long as attempted warranty repairs were made during the warranty period. Does the CA Lemon Law apply If my vehicle has not had any warranty repairs in the first 18 months and 18,000 miles? Yes. As long as the vehicle has warranty repairs, regardless of when they were performed, or the mileage on the vehicle when the repairs were performed, the Lemon Law will apply. Do I have to go to arbitration prior to pursuing a CA Lemon Law claim? No. A consumer may go to arbitration prior to pursuing a CA Lemon Law claim, but is not required to. Does the California Lemon Law apply to vehicles or consumer goods that are not covered by any warranty? No. The Lemon Law is solely based upon warranty and warranty repairs. A simple rule applies – no warranty, no Lemon Law case. Where may I find the text of the CA Lemon Law? The Lemon Law (officially known as the Song-Beverly Consumer Warranty Act) may be found in sections 1790 through 1797.96 of the California Civil Code. For more information browse our site or contact the Law Offices of David J Farrell!